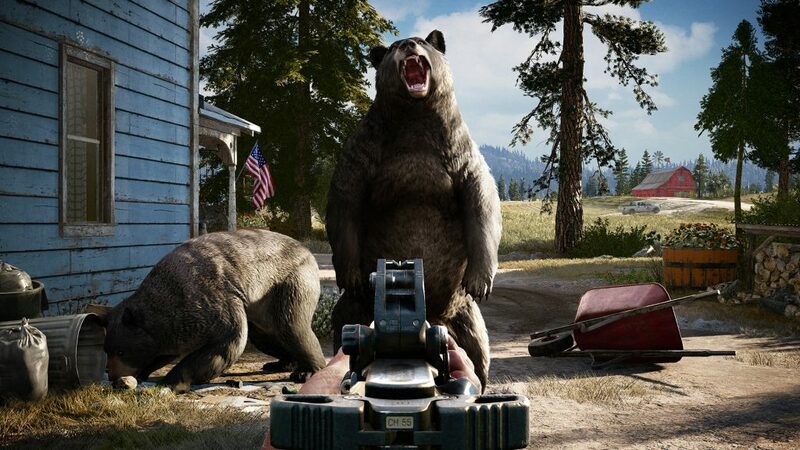 With moments like being chased by hillbillies on tractors and running through the streets of small-town America blasting bad guys with a revolver, things in Far Cry 5 have changed a lot since the last installment, but they kinda also haven’t changed at all. 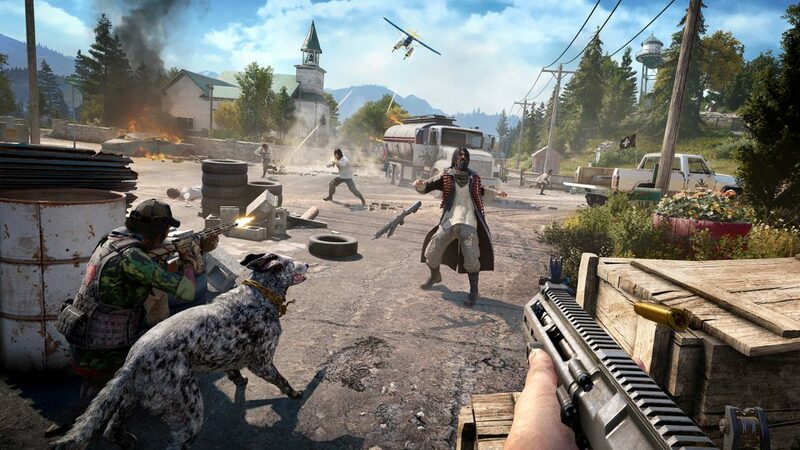 The setting of rural Montana may be a departure from mountainous wilds and vague islands, but the mechanics and feel of Far Cry 5 could almost position it as a reskin of the last core entry in the series. The demo I got my hands on at PAX Aus put me in an extremely familiar position, where I had to liberate an enemy stronghold for the protagonist’s cause and unlock new quests. It’s so incredibly Ubisoft that it felt like I’d done this kind of thing a thousand times before, and not just in the Far Cry series. Oh, an FPS, real original. But hey, it’s still a fun thing to do and taking out enemy fortifications in any way you see fit is still as exciting as ever. To help you in your endeavours in Far Cry 5 you can buddy up with a sidekick Gun for Hire, or tamed animal Fang for Hire, which are features that we saw previously in Far Cry 2 and Far Cry Primal respectively. Stalking into town I tried for a stealth approach with my buddy, which was immediately foiled, resulting in a mess of a fight as I tried to level the unwieldy revolver onto the faces of radicalised hicks. Aiming in general felt very clunky, and hit box recognition wasn’t solid. I was often left wondering why a shot I thought was sure to murder a dude flat out did nothing. It’s worth acknowledging this is an early build ahead of next year’s launch, but it left me frustrated throughout the demo. Using a sniper was barely viable, as trying to move the scope a few millimetres often resulted in my character flipping out and hitting trees hundreds of metres away as he erratically span. Little gripes aside, the raw experience of Far Cry 5 was still underpinned by random encounters and laughable moments that keep me optimistic ahead of launch. When storming an enemy controlled air base I thought I had a grenade equipped, so when I accidentally threw a piece of meat at an enemy, only to see a grizzly bear run out of the woods and maul him and his friends, I couldn’t help but burst out laughing at the absurdity of it all. Oh god… you can keep the pic-a-nic basket! My time with the demo ended kind of abysmally, but also perfectly. As I sauntered down to a watering hole to give fishing a shot, an NPC smashed into me from behind out of nowhere in what must have been a turbo charge tractor, causing my character to rag doll off into the horizon. Judging from what I played, Far Cry 5 doesn’t seem to tread too far from the familiar, but with the right amount of polish on this core experience it still looks like it could be another hit for Ubisoft. Far Cry 5 is due out on PS4, Xbox One and PC on February 27 2018. Accidentally throw bear bait with Charlie on Twitter @clbraith, and don’t forget to follow LoadScreen on Twitter and like us on Facebook.